We’re just days away from the roll-out of a new BlackBerry smartphone, the BlackBerry Leap. The Leap made its debut at MWC last month and will be available at a fantastic price on 1st May. Let’s have a little delve into what this new budget smartphone has to offer. 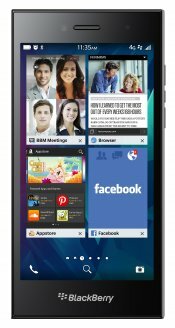 The first thing to note about the BlackBerry Leap is that it’s entirely touch screen – no signature keyboard like so many other of Blackberry’s recent releases. . That touchscreen is a 5-inch LCD 720 x 1280 with a resolution of 294 pixels per inch – that’s a premium size screen albeit with a midrange resolution. In terms of its other ‘vital statistics’, the Leap measures a slimmish 9.5mm in depth and weighs in at 170 grams, so it’s a good size for hands and pockets. Camera-wise, the Leap sports an 8-megapixel camera with autofocus and an LED flash on the rear and a 2-megapixel camera on the front – clearly, there are better cameras on the market but for a budget phone that’s more than respectable. The BlackBerry Leap will be installed with BB’s new 10.3.1 operating system which has some great new features as well as upgraded favourites. The Action Bar has had a make-over and displays the most popular functions, there’s faster access using quick settings and useful information is now shown on the Lock Screen. The Leap will also feature BlackBerry Blend which gives you access to documents, messages, your calendar and contacts on all of your devices, BlackBerry Assistant is a new virtual PA a la Siri/Cortana and there’s an great new BlackBerry Hub. In addition, the camera software has been improved and the Amazon Appstore comes pre-loaded. On the inside, there is a Snapdragon 1.5GHz dual-core processor and 2GB of RAM. The Leap comes with 16GB of onboard storage and as the handset supports a MicroSD card, this can be increased to 128GB if required. The 2800mAh battery offers around 24 hours of medium to heavy duty use between charges. In summary, the Leap is a solid budget smartphone which is aimed at young entrepreneurs who’ll be attracted by Blackberry’s industry leading security features. You can pre-order the Leap handset from Direct Mobiles here.